Let Your Inner LEGO-Lover Loose in Hawaii! I have a six year-old son, which means this: My world has been overtaken by LEGOS. But, secretly, I love the little, colorful bricks, too (just don’t tell him!). I mean, who DOESN’T love to build amazing designs using one’s imagination and creativity? And, who ISN’T amazed by some of the amazing LEGO creations out there? Now, you can see some of the most amazing LEGO creations up-close, thanks to LEGO Master and award-winning New York artist, Sean Kinney. Now through July 10th, three of his extraordinary creations will be on display at the McBryde Garden at the National Tropical Botanical Garden in Poipu, Kauai. Specifically, the sculptures feature a monarch butterfly with a 6-foot wingspan, a foot-long mouse about to be pounced on by a snake three times larger, and a 5-foot-long praying mantis on the hunt for insects. One of Sean Kenney's creations, a polar bear, was on display at Utah's Hogle Zoo. 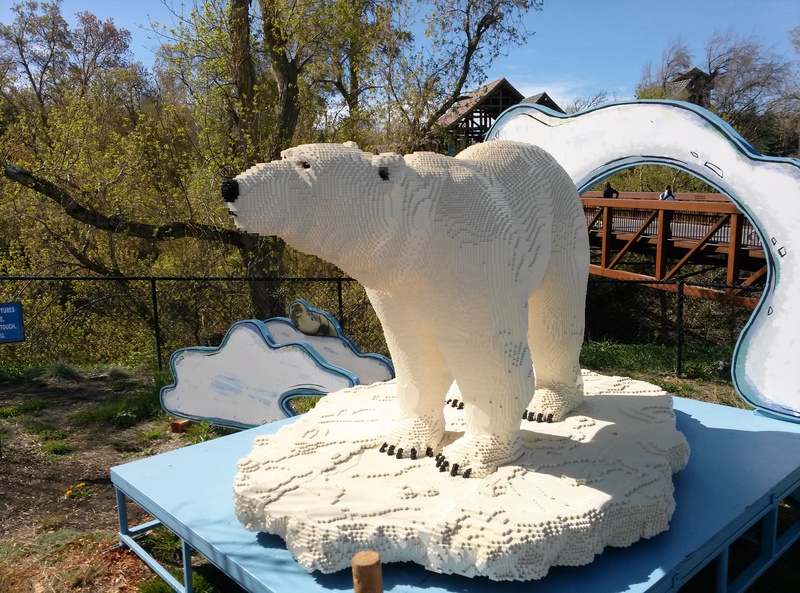 According to the Honolulu Star Advertiser, the three LEGOs in Hawaii belong to a collection of 107 larger-than-life statues inspired by nature that will be appearing at zoos, gardens, museums and arboretums around the world over the next few years in five traveling sets themed Nature Connects. The sculptures coming to McBryde Garden were created from more than 378,000 Lego bricks. 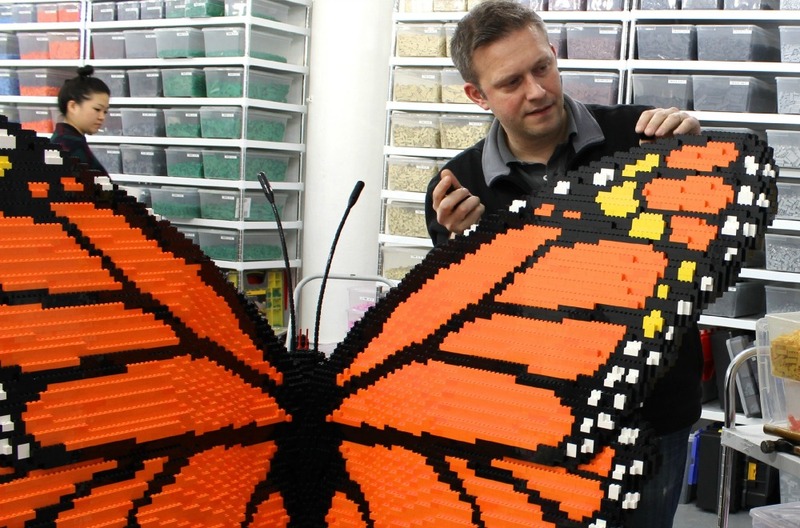 It took 60,549 pieces and 400 hours to construct “Butterfly on Milkweed,” the most intricate sculpture in the set, the paper reports. “Our biggest challenge is making something round and curvy with hard little plastic rectangles,” Kenney told the paper. According to the Honolulu Star Advertiser, every sculpture begins with research, including numerous photos and drawings of the subject. Using those for reference, Kenney sketches ideas on graph paper that he designed in the shapes and sizes of Lego bricks. He and his team then build prototypes using the sketches as guides. Kenney has said his biggest challenge is making something round and curvy with hard little plastic rectangles. The prototype Kenney likes best becomes the template for a sculpture. One by one, Lego bricks are locked together and affixed to a supporting steel frame with a strong chemical solvent. The finished creation is coated with UV-protectant lacquer to shield it from the sun’s potentially damaging rays. “We don’t use custom Lego pieces; everything is exactly what kids can buy at stores. It’s cool that a 2-year-old child and a professional builder can snap two Lego pieces together, and the result is the same. It proves that this medium has more to do with creativity than skill. The key is to keep dreaming, keep building and don’t grow up!,” Kenney told the paper. Kenney is constantly adding to the Nature Connects collection to keep it fresh. He’s currently working on a 25-square-foot coral reef with seahorses that are 2 feet tall. If you’re interested in seeing these LEGOS in Hawaii, call Hawaii Aloha Travel and find out how you can make a visit part of a day full of Kauai Activities. You can take a shuttle that departs every hour on the half-hour from 9:30 am to 3:30 pm. from the McBryde Garden Visitors Center. Cost is $30 for adults, $15 for children age 6 through 12, free for kids 5 and younger; includes garden admission; 10 percent kamaaina discount. Daily entry is limited; advance online ticket purchase is advised. Visitors are welcome to bring food and nonalcoholic beverages or purchase them at the visitors center cafe. Call 808-742-2623 for more information or email tours@ntbg.org. You can aslo check-out the garden’s website at ntbg.org.